* Interested in attending this show? Although we are sold out, we have created a wait list for fans who’d like to attend. We will call from the wait list to fill any empty seats or if we are able to book a second show. Click here to add you name to the wait list. UP CLOSE INTIMATE AND PERSONAL: Limited admission for only 65 guests in A one-of-a-kind live acoustic performance experience at a live recording studio. PERFORMING SOLO/ACOUSTIC HITS FROM: Zebra, Led Zeppelin, Bowie, The Beatles, Pink Floyd, Moody Blues Elton John and many more. Randy Jackson is the lead singer/guitarist for the rock band Zebra. Randy’s first foray into recording success began with the self-titled Zebra debut album, released on Atlantic Records in 1983. Critically acclaimed for its lush rock sounds, due in large part to Jackson’s searing lead vocals and soaring guitar leads, the album sold 75,000 copies the first week and became the fastest selling debut album in the history of Atlantic Records. “Who’s Behind The Door” and “Tell Me What You Want”, written by Jackson, received serious notice in the press, and helped to form legions of Zebra fans almost instantly. Their first album, “Zebra”, went Gold and became the fastest selling debut album in the history of Atlantic Records. During the next couple of years Zebra played opener for Aerosmith, Journey, ZZ Top, Loverboy, Cheap Trick, Sammy Hagar and REO Speedwagon. Today Randy continues performing the Music of — Symphony Shows nationwide with the Loal Symphony Orchestras to sold out audiences. 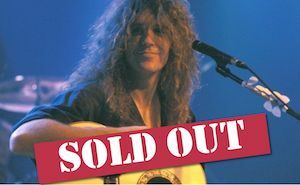 Randy also finds himself performing limited dates with his Solo Acoustic Show to fans in cities All over the country. Performing Hits from Zebra and popular classics from Led Zeppelin, Pink Floyd, Rush, The Beatles etc. Interested in attending this show? Although we are sold out, we have created a wait list for fans who’d like to attend. We will call from the wait list to fill any empty seats or if we are able to book a second show.